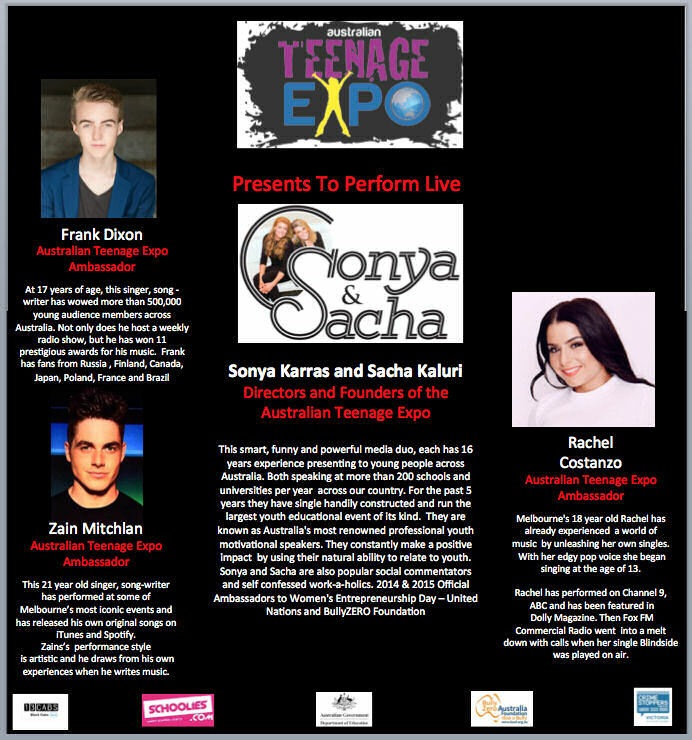 Your school/community could have the opportunity to have an Australian Teenage Expo (ATE) Event featuring two of Australia’s most sought after speakers on Youth issues – Sonya Karras and Sacha Kaluri. Funding valued at $10,000! The successful schools/communities will receive a full day of presentations (Unlimited amount of your students can attend) on youth issues – important to your students and educators. • Promotions, freebies, giveaways and even links to youth focused products. Young people love to learn whilst being entertained! Sonya and Sacha have built their 15-year speaking reputations on being down to earth, informative, funny and approachable. They travel Australia every year presenting to more than 400 audiences, delivering life saving messages mixed with real stories; which will leave your students with a lasting impression. The Sonya and Sacha Show will now go “On The Road” and visit every State and Territory in Australia. 100,000 Victorians and 16,000 Australians teens will see this show at no cost to them. This full day of entertainment is a roller coaster ride of emotion, inspiration, motivation, stories, laughter and opportunities to get your students thinking creatively, whilst having “A-HA” moments. We open up their minds and leave them thinking – maybe the impossible is possible. Sonya Karras will speak about drugs, alcohol, safe partying and keeping yourself and your friend’s safe when celebrating. Sacha Kaluri will address careers, choosing the job of your dreams, how to motivate yourself to achieve anything. Sonya and Sacha will then come together and speak about success, failure, relationships, respect and introduce students to the Online Virtual Australian Teenage Expo. Between these two ladies they are experts a huge number of youth issues of interest to your students, staff and parents.